An automated irrigation system waters your yard without you having to think about it – and that’s the problem. If you set the system and then forget it, this convenient device can cost you money, waste precious drinking water and weaken your trees and plants. Forgetting an irrigation system most often means a homeowner is overwatering grass, plants and trees. Soggy soil can prevent trees and plants from pulling in essential elements from the soil, such as nitrogen and iron, and suffocate the roots. The water conservation specialists from the AMWUA cities worked together to deliver a simple solution. Text WHENTOWATER to 33222 and receive a text message on the first of each month with a link to that month’s unique watering guide. The guide reminds you to change your settings as the weather changes and gives you precise watering instructions for all your plants. This easily accessible information can help you keep your yard looking its best. Plus, this is one more way to help you save water—and money. 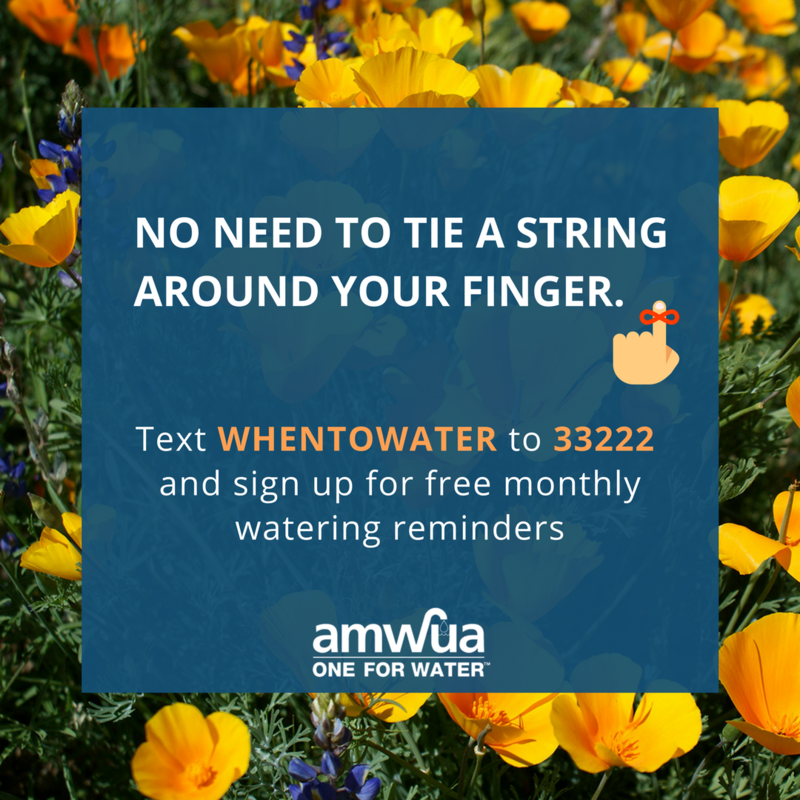 The AMWUA Regional Conservation Program officially launched the watering reminder text alerts this month. The alerts link you to a smart little chart that shows you how often to water everything in your yard, including grass, cactus and annuals. The chart also includes watering instructions when plants with different watering needs, such as trees and shrubs, are on the same valve. The watering guideline charts were developed by the City of Mesa from the popular guide, Landscape Watering by the Numbers. 2. The second step is to learn how to adjust the run times on your automated irrigation controller so you can quickly match run times to your WHENTOWATER text alert. Watch the manufacturer’s how-to video designed for your controller. Typical controllers are not difficult, but they can be confusing at first. People often set their controllers once and forget about it or leave it up to a landscaper, who may or may not care about the amount of outdoor water you use. The changes in your water bills are driven by outdoor use and that’s where you can best save money and help save more drinking water for drinking. Your city is always looking for new ways to make it easier for you to learn about keeping a landscape thriving in the desert. Check AMWUA’s and your city’s water conservation websites to get more information about free classes, DIY videos, brochures and tip sheets that help you save water outdoors. Some cities offer rebates to help you pay for the cost of a new irrigation controller or the cost of converting some grass to desert landscaping.